Today I want to share another great early riser interview with all of you! I have been talking to the fantastic blogger Vidya Sury, author of VidyaSury.com. "I secretly feel that the day magically stretches beyond the actual 24 hours! I get a great headstart to my day by rising early. I am mentally more alert and I get more done." Want to become an early riser just like Vidya? 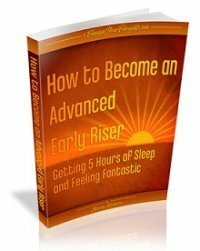 Then I strongly suggest you to check out this fantastic book that explains it all how to become an advanced early riser. This is so far my personal favorite on the topic (since I haven't written one myself yet...) and many of the thoughts on this site originate from this book. It's written by well-known personal development blogger Steven Aitchison so you'll be sure to get pure quality. Vidya, can you start by telling me about your normal morning routine? I set my alarm at 5.15 and am usually up by 5.30 (yes, guilty of letting the alarm snooze just once!). After I freshen up, I get the coffee going. Before coffee, I offer a cup of sweetened milk at my prayer altar and pray for 15 minutes or so. This can be a chat with the Almighty, reciting prayers or just quiet deep breathing for 15 minutes. Then, I start preparing to cook lunch for my husband and son. Once they wake up at around 6.45, we all enjoy coffee together – I cherish those five minutes and then we get on with our respective responsibilities. Around 8 – lunch boxes are packed, everyone is ready to leave for school/work and as a work-from-home Mom, I am happy to begin my own day. I love my morning routine as I really enjoy cooking. It is a peaceful time of the day for me with just the kitchen sounds and my happy thoughts in the ambience of the frankincense fragrance wafting in from the prayer room. As a child of the sixties, I grew up in a household where it was normal for everyone to be up at 4 am. We were a large joint family of eight with at least five houseguests at any given point of time. We lived in a large house. Each one of us was responsible for specific household chores, allotted according to age. As soon as we woke up, we had the tradition of washing the front yard and drawing a design with rice flour and lighting the lamp; the idea was to welcome the Goddess of Wealth. It is auspicious to pray at a particular hour in the early morning and as an orthodox family, we followed all sorts of rituals and traditions. While I am not a big fan of rituals, somehow, the routine I grew up with was very comforting, like clockwork, you know? Also – I enjoy being an early riser. I secretly feel that the day magically stretches beyond the actual 24 hours! I get a great headstart to my day by rising early. I am mentally more alert and I get more done. When I have a work deadline, being up early allows me to work fast and peacefully without interruption. I've often found that starting the day early helps me achieve more in those two hours early in the morning than I can during the entire day! I believe it keeps me healthy, energetic and active. To enhance this benefit, I start the day by drinking a couple of glasses of water. I also soak some almonds overnight and each of us has two of those in the morning for a memory boost. When my husband and son have the day off, we try and fit in an early morning walk, which is pure bliss. Not for me. But if one has to stay up late at night, rising early may mean inadequate sleep. When I stay up late, I am still up at the usual time. I catch a power nap in the afternoon to ensure I am well-rested. Simply by growing up in a family of early risers. It was believed that sleeping late was not good for health, nor was it good practice. Moreover, I enjoy being up early and feel privileged to catch the early rays of the sun. Again, luckily, I grew up in a family that believed in healthy eating. We are vegetarians and I am personally a big fan of salads, soups and fruits. We rarely cook spicy food, yet we eat tasty food. I enjoy cooking and try to be creative with ingredients. I ensure we drink plenty of water. We are an overall healthy family, except when suffering from a cold or cough during the weather change. Lately, I have developed the habit of relaxing for an hour in the afternoon, reading for half an hour and happily dozing off the other half. When I wake up, I am refreshed and find I function better. We go for a walk every evening at the walking rink near our house. It is around a beautiful lake and we look forward to it. As a close-knit family, we enjoy the togetherness. I believe that being an early riser has helped me be a calm yet cheerful person. I think that the morning hours are magical. There is something about that time of day that inspires me a lot. I often get my best writing done in the early morning when thoughts seem to flow smoothly. Perhaps it is because it is so close to a good night’s rest and it is easy to do everything enthusiastically. Later in the day, the energy wanes a bit. I also practice meditation and this enhances my life. When I had a corporate job, I used to prefer meeting clients early in the morning since most of my clients were in the Industrial area and began their work day at 6.30 am. They really appreciated that I took the time out to go meet them at their convenience – they preferred to have visitors at that time as they would get involved in their own factories after 9 am. This used to give me a great sense of accomplishment and set the great tone for the rest of the day. Thanks to this I had a successful career. Now, as a work at home Mom, I love my morning routine, which I described above. Being able to do this fills me with a sense of satisfaction and I always begin my day on a positive note, confident I can accomplish anything. I prefer grocery/greens shopping early in the morning as the produce is fresh and straight from the farm. This means I don't have to get out in the sun to buy wilted stuff and get stressed out about taking time off work! As an early riser, I am more optimistic, focused, positive and healthy. Yes, I completely endorse starting the day early! 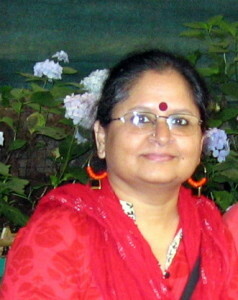 Vidya Sury is a fantastic freelance writer and professional blogger. She gives her very original perspective on everything from happiness to overcoming daily tasks. "Blogging, to me, is freedom of expression. I enjoy sharing smiles, how-to’s, health tips, inspiring stories, experiences and useful information about everything under the sun, moon and stars." I just want to say thank you Vidya for sharing your thoughts in this early riser interview! You have provided us with some great insights and in-depth knowledge about your life as an early riser, mom and freelance writer. The stories you have shared with us today are both inspiring and full of lessons.